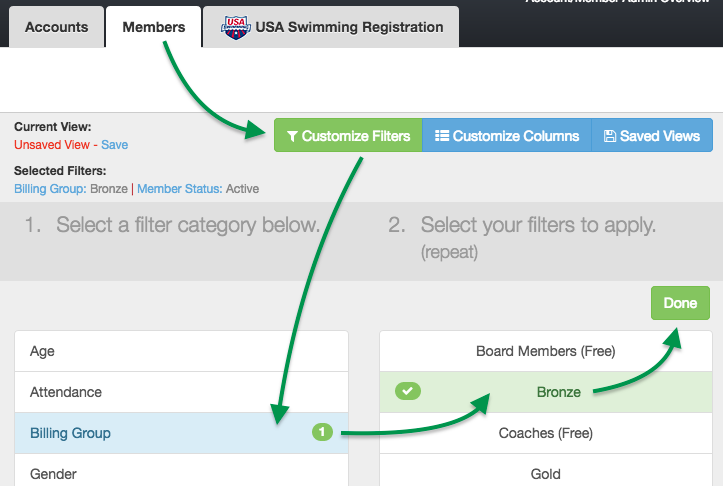 After we import your membership data and times into SwimOffice, now is the perfect time to clean it up and organize it. Sign in to your SwimOffice site. 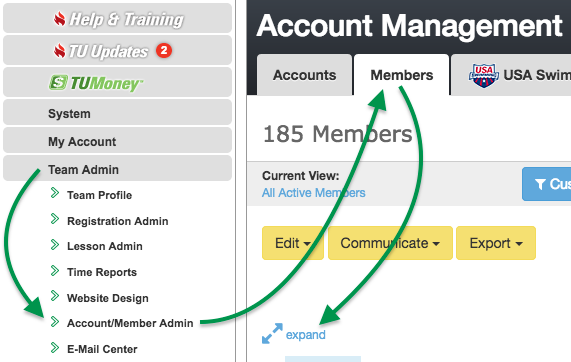 In the side menu, click Team Admin > Account/Member Admin. Click expand link (below Edit button). Review your team and contact Deployment if something looks wrong. 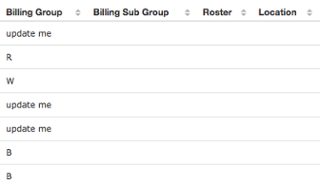 Note the Billing Group, Billing Sub Group, Roster (or Squad in UK) and Location columns. You will use all of these to organize your team to bill, view and communicate with select groups. 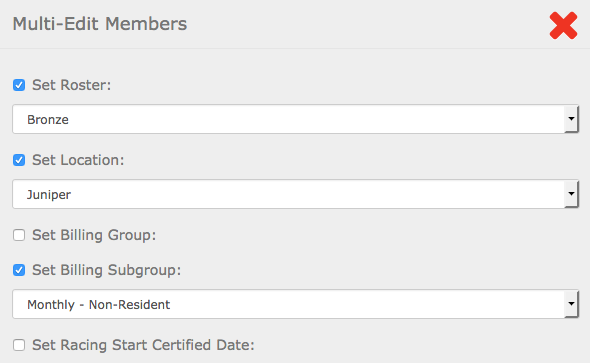 Those who sent us a membership database from Team Manager that we then imported will notice the Group and Subgroup fields get combined into the Billing Group. You will likely want to modify these names. Some Billing Groups may be listed as update me, indicating they were blank and you will need to change them to what group they belong to. We will return to this screen later. Click collapse link to bring back the side menu. In the side menu under Team Admin, click Team Profile. Click the Group Setup tab. 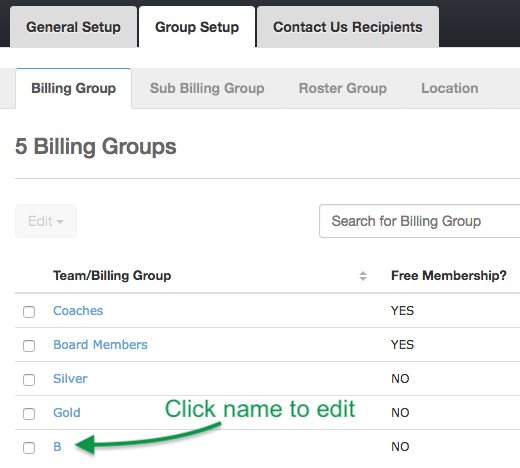 Billing Group tab — These are broad categories of groups that get charged different rates. They may be the same as your Roster Groups/Squads. Even if you charge all groups the same, list each individually if you want to track the income of each separately. Click a name and rename it to something meaningful if you like, as you are not limited to three characters. You may also click Add Billing Group to add new ones. If you want to delete any billing groups, you will need to move everyone assigned to that group to a different billing group first. Click Sub Billing Group tab. For now simply add a single group called Monthly. If you will be using our billing system, an Account Manager will help you set this up further at a later date. Click Add Sub Billing Group. Enter Monthly for the Sub Billing Group Name. Click Roster Group tab (or Squad in the UK). These are often your practice groups or age groups. Add as many as you need, and pick a different color for each. You will use these in OnDeckwhen taking attendance. Leave the Type of Roster Group as Membership & Calendar. Click Location tab. If you only have a single location, add one called Pool or the name of your facility. Otherwise add the name of each location. With your groups defined and cleaned up, you will now use filters and the multi-edit function to assign athletes to each group. In the side menu under Team Admin, click Account/Member Admin. You may want to click expand again to maximize the display. Note the Billing Group column now reflects the changes you made. Click Billing Group on the left. On the right click a single Billing Group. Click Done. You will now only see athletes in the group you selected. If these athletes are in more than one location, you will need to manually select the athletes in one location (check the box by their name). Otherwise select them all (click the checkbox by Last Name). Click Set Roster (or Set Squad in the UK) and pick their Roster/Squad. Do the same for Set Location. 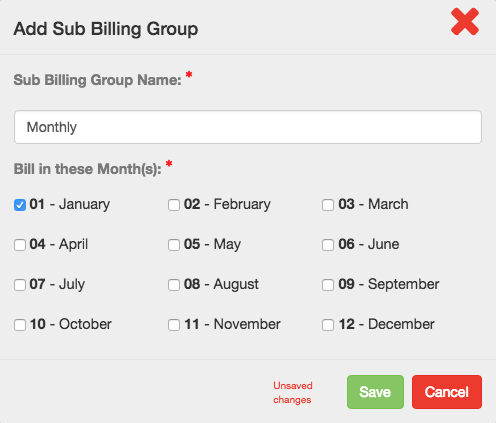 Click Set Billing Subgroup and choose the one you defined. Click Save. This will update all the Members you selected with the fields you chose. On the right click the group you chose to uncheck it, then choose your next group and repeat steps 8-17 until you’ve set the groups for all athletes. If some or all of your athletes are missing IDs because you did not send us a file with all of your meets results, you need to build all the missing IDs. This is because we connect athletes to their results exclusively with their athlete ID, not their name. There are two scenarios. If your team belongs to USA Swimming, or your team's governing organization does not assign IDs, or your team does not belong to a governing organization, you can use USA Swimming's formula to build IDs for all athletes without one. The ID is comprised of an athlete's date of birth, first three letters of their first name, middle initial, and first four letters of their last name. It's a simple but effective formula to ensure unique IDs. 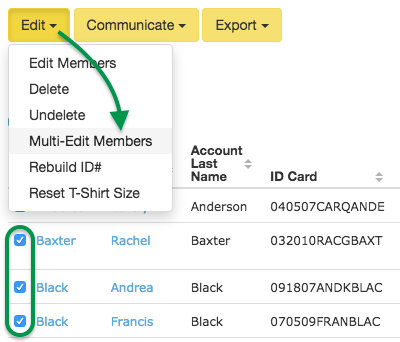 SwimOffice makes it easy to fix all the missing IDs; just read how to build missing athlete IDs in bulk. If your team belongs to a governing organization like Swim England or Swimming Canada (but NOT USA Swimming), they create IDs for athletes. 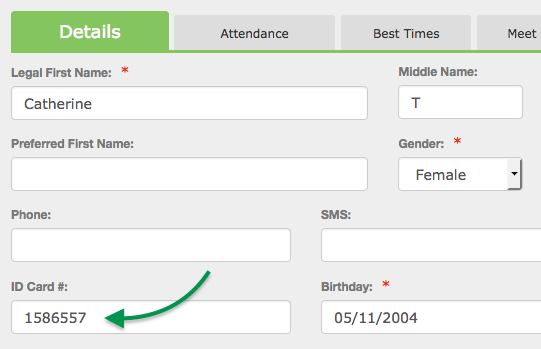 For each athlete with a missing ID, you will need to click their name to edit their profile, fill in the ID Card # field with the ID from your swimming organization, and click Save. If you sent us a file of all your meet results to import, follow these steps to verify that your times were correctly uploaded. 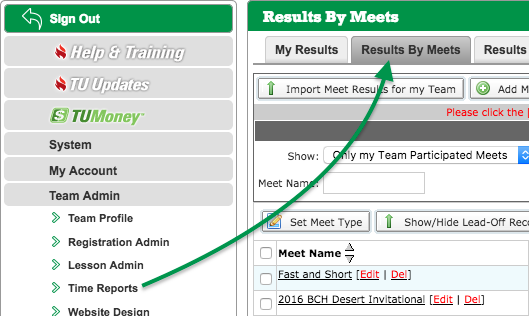 If you do not have a results file to send, you may want to manually add all your athletes’ best times. In the side menu under Team Admin, click Time Reports. Click Results By Meets tab. You will see a list of all your meets for which you have results. If you want to spot check the results, click a meet name. Click the LSC-Team dropdown and select your club’s code. If you see names in blue, it means the ID does not match any athlete’s ID in Account/Member Admin. Highlight the ID and copy it (right click and select Copy). Follow the steps in our Merge ID article, where you will paste the ID you copied into the Incorrect Id# field.